Some cakes are for celebrating – stacked into gravity-defying layers, enrobed in silky sweet frosting, and decorated until they sparkle. And then there are the more humble cakes. They often look plain on the outside, but they taste fantastic. They’re quick to throw together and suitable for every day eating. This is one of those cakes. What I love most about this Spiced Apple Bundt Cake, aside from how good it tastes, is how easy it was to prepare. There’s no creaming butter and sugar, no adding mixtures in intervals, no incorporating eggs one at a time. You pretty much just throw all of the ingredients in the mixer and turn it on. Done. As Ina Garten would say, how easy is that? The cake itself is moist and sweet with just the right amount of texture from the apples and pecans. Because it doesn’t have any delicate layers or melt-able frosting, it would be easy to take along wherever you go. It tastes great plain, accompanied by just a cup of coffee or tea, but it also lends itself to dressing up too. You could easily add a glaze, top with more dried cranberries and chopped pecans and serve this as an easy dessert. Or you could warm up a slice and top it with a big dollop of plain 0% Greek yogurt for a decadent breakfast treat (like I’ve been doing all week). It really is a versatile cake and definitely one I can see myself making over and over again! You can substitute raisins for the dried cranberries if you prefer, and 4 tablespoons of warm water for the apple cider & bourbon. I like spice, so I used heaping measurements for all of the spices in this recipe. Golden Delicious apples will work too, but don’t use Granny Smith – you need an apple that holds it’s shape. In a small bowl, combine dried cranberries, apple cider, and bourbon. Set aside. Preheat oven to 350°F. Coat the inside of a 10-inch bundt pan with baking spray. In the bowl of an electric stand mixer, whisk together flour, baking powder, baking soda, allspice, cinnamon, nutmeg, ginger, cloves, and salt. Add brown sugar, granulated sugar, butter, eggs, and vanilla. Beat on medium-high speed with the paddle attachment for about 2 minutes, scraping down the sides as needed, until batter is pale and smooth. Add 2 teaspoons of liquid from the dried cranberries to the batter – drain the rest. (If you used water, you can skip that step.) Fold the cranberries, apples, and pecans into the batter. Spoon into prepared pan, smooth the top, and bake at 350°F for about 1 hour, or until a skewer comes out with just a few moist crumbs. Cool 10 minutes in pan on a wire rack, then invert cake onto rack to cool completely. Store covered at room temperature. Dust with powdered sugar just before serving. I’ve always kind of wondered why exactly certain ingredients MUST be mixed into cakes at certain times…when the end result is that everything get smushed together eventually. I love the ease with which this cake can be thrown together. And the spices. And the apples. Such a great flavor that kind of makes you want to curl up in bed with a slice. This looks moist and delicious. 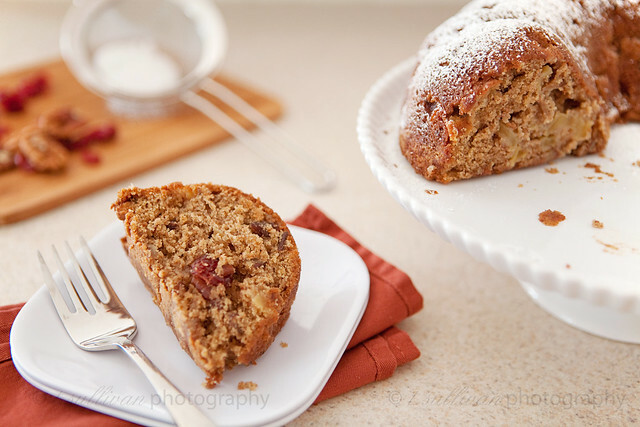 My dad’s favorite cake on the planet is apple cake – he would love this! Oh yum does this look good. I need to pick up some more apples so that I can give it a try!